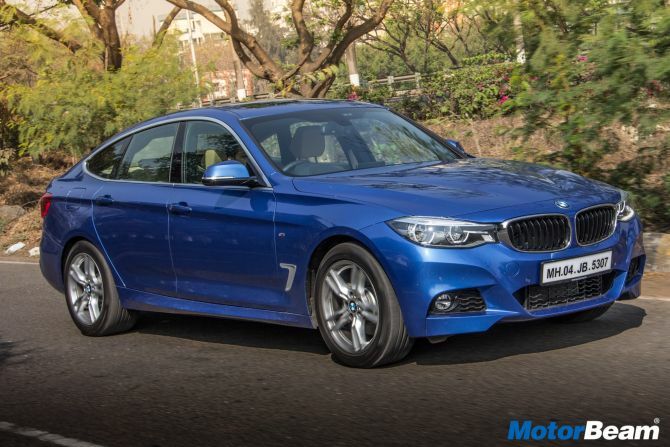 Indian automobile website MotorBeam.com has a go in the 330i GT M Sport to find out what this new variant is all about. 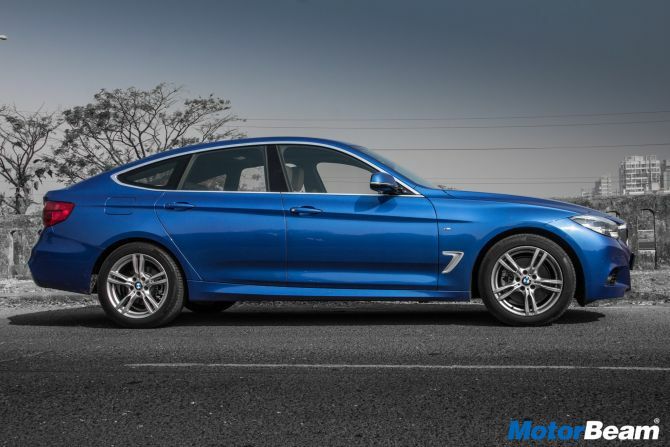 GT badged BMW cars are all about practicality but what if the same GT badged BMW was given an M Sport treatment? The BMW 330i GT M Sport is just that. The 330i GT M Sport (now the range-topping trim) is a 3-Series based sedan that offers a good blend of looks and practicality. Based on the 3-Series sedan, the 330i GT M Sport gets an aggressive and sporty looking front bumper with larger air dams. The signature kidney grille is finished in high-gloss black, there are M badges on the front side panels, side window frames finished in satinised aluminium and high-gloss chrome finish on the tailpipe. Since this is the M Sport trim, you also get 18-inch Star-spoke M light alloy wheels and two exclusive colour options - Alpine White and Estoril Blue. Two things we love about the 330i GT M Sport are the frameless doors and the active rear spoiler! 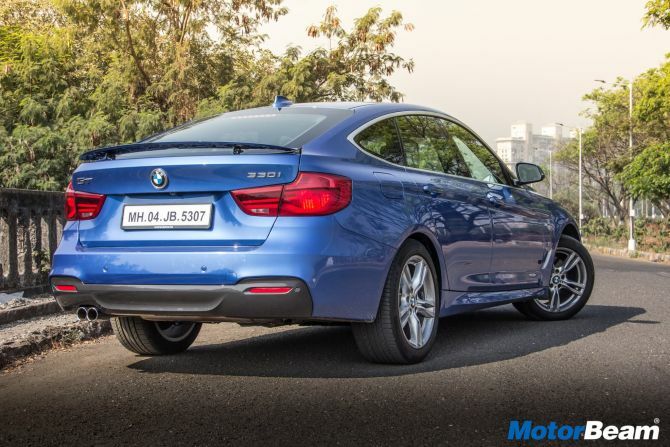 Like the usual 3-Series sedan, there are adaptive LED headlights with LED DRLs, LED fog lights and tail-lights. The cabin of the 330i GT M Sport is similar to the regular 3-Series sedan but there are subtle changes the German automaker has brought in. For instance, the BMW Individual anthracite headliner is exclusive to this trim only. 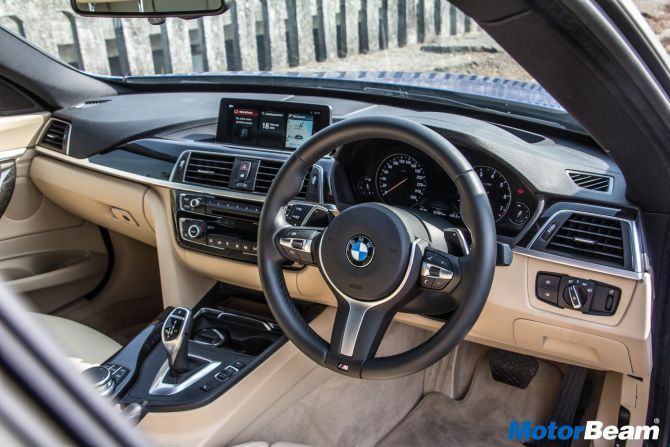 There is an M multi-function leather steering wheel and Sport seats for the front passengers. The cabin gets a blue accent on the dashboard and the door trims which quite complement the sedan's racy exteriors. A 10.5-inch touchscreen iDrive infotainment system paired with 9-speakers takes care of audio needs in the cabin. The iDrive system gets Navigation, Bluetooth and USB connectivity. The front seats offer great comfort and support while at the rear, headroom is slightly less because of the sloping roofline. Otherwise, there is ample legroom and shoulder room. The front seats are electrically adjustable while the driver's seat also gets memory function. Other features on offer are a panoramic sunroof, 2-zone automatic climate control with rear AC vents, Start/Stop button, automatic headlamps and wipers, full-colour Heads-up display and a rearview camera. 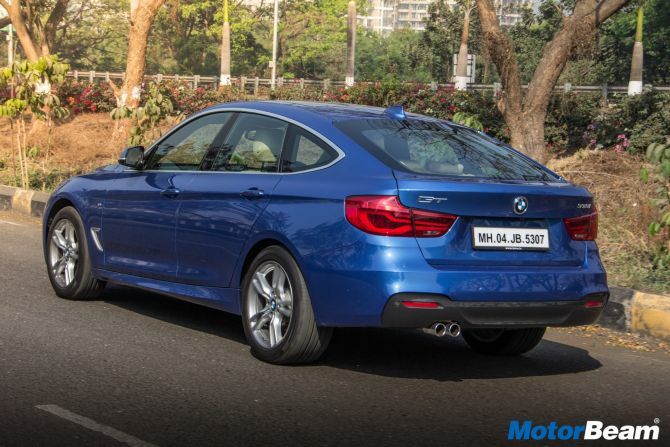 Powering the 330i GT M Sport is a 2.0-litre 4-cylinder TwinPower Turbo petrol engine that churns out 252 HP of power at 5200 RPM and 350 Nm of torque at 1450-4800 RPM. An 8-speed Steptronic Sport automatic transmission sends power to the rear wheels. 0-100 km/hr comes up in just 6.1 seconds while returning an average claimed fuel-efficiency of 15.34 km/l. The motor is superbly refined and feels super quiet. There are four driving modes to choose from, Eco Pro mode makes the engine feel sluggish but in turn gives you the best mileage. The Sport mode makes an enthusiast behind the wheel smile. Responses become fast and the powertrain feels aggressive. Sport+ mode is the same as the Sport mode but deactivates the Dynamic Traction Control. Comfort mode is the one to be in as it offers a good blend of performance and fuel efficiency. Drive the car sedately and it will return you a mileage of around 10-12 km/l. As compared to the regular 3-Series sedan, the 330i GT M Sport gets a softer suspension setup and this helps make the ride comfortable. Bad roads are a breeze for the car and it feels composed at high speeds. This being a GT, the difference in dynamics is evident. 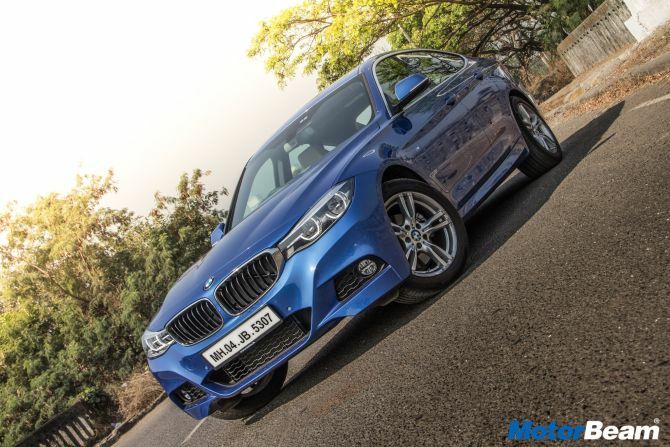 The 330i GT M Sport isn't as fun as the regular sedan in the corners and body roll is quite noticeable. Grip from the tyres are great and so are the bite from the brakes. 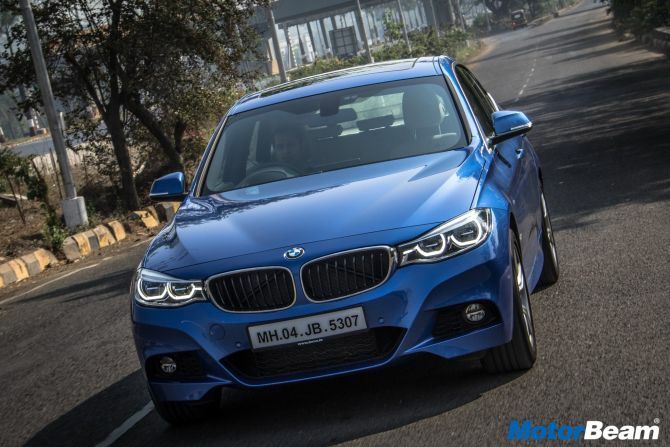 The 330i GT M Sport gets a host of safety features like multiple airbags, ABS with Brake Assist, ISOFIX child seat mounts, tyre pressure indicator, Runflat tyres with reinforced sidewalls, DSC with DTC (Dynamic Stability Control with Dynamic Traction Control) and Cornering Brake Control. While the after-sales service of the carmaker has been pleasing, it also has a good reach across the country with workshops set up in major cities including metros. The 330i GT M Sport makes for a sensible buy if you're a fan of the 3-Series sedan but want more practicality out of it. While you do miss out on some driving pleasure, it isn't boring either. Also, the M Sport trim looks a lot sportier both inside and out. Toyota Camry Hybrid looks smarter and has zing!